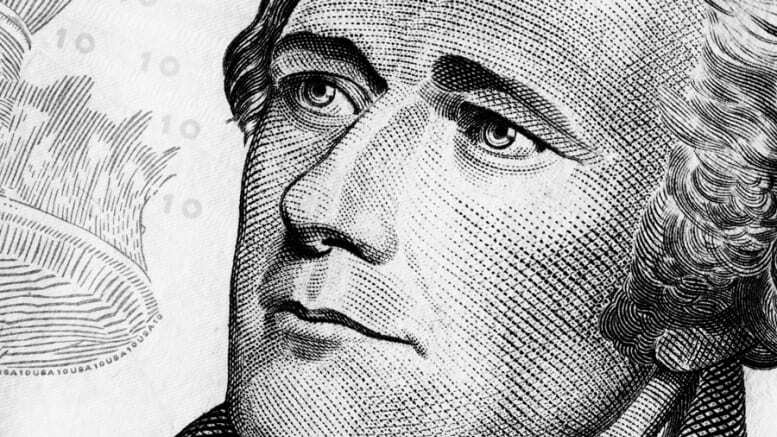 June 19, 2018 — To mark the debut of “Soldier, Secretary, Icon,” the National Postal Museum’s new exhibit on Alexander Hamilton, here are five facts you may not know about our $10 Founding Father. 1. He was an immigrant. Hamilton was born on the Caribbean island of Nevis and immigrated to New York City in his teens to attend King’s College — now Columbia University — where he became a political writer and speaker but left to fight in the Revolutionary War. Later, Hamilton became a top aide to Gen. George Washington. 2. He (sort of) oversaw the Post Office. In the 1790s, the Post Office was nominally under the supervision of the Treasury, which Hamilton ran as secretary. Then-Postmaster General Timothy Pickering was effectively in charge of the Post Office. 3. Postage? He didn’t pay it. In his role as treasury secretary, Hamilton was permitted to send official correspondence without postage by signing his name on the cover. He frequently corresponded with customs officers to retire the nation’s war debt, assuring that all revenue was properly accounted for. 4. But he has appeared on postage stamps. The first stamp featuring Hamilton, released in 1870, showed a marble bust of him. The bust was a favorite of Hamilton’s widow, Elizabeth, who displayed it in her Washington, DC, home after he died. 5. The duel that caused his death was escalated by a letter. Aaron Burr blamed Hamilton’s outspoken opposition of him for losing the 1800 presidential election and the 1804 New York governor’s race, and was especially angry about a published letter attributed to Hamilton that called him “despicable.” Burr challenged Hamilton to a duel in 1804 and fatally shot him.